President Obama announced Tuesday an array of steps his administration will take in the coming years to reduce greenhouse gas emissions and combat climate change. While some reports suggest such moves would come with a high price tag, CPS Energy customers have little cause for concern, since the utility has already begun to diversify and reduce the carbon intensity of its power plant fleet, increase customers’ energy efficiency and upgrade its electrical grid. “Our strategy has gotten us out in front on a number of these issues,” said Doyle Beneby, CPS Energy President and CEO. Through all of its strategies, Beneby said, CPS Energy is reducing its carbon emissions by 5.3 million tons by 2020, a 29 percent decrease since 2011. CPS Energy was the first utility in the nation to announce, in 2011, that it would retire its two oldest and dirtiest coal units, known as JT Deely, some 15 years ahead of schedule. Beneby said the utility would use the billions it would have otherwise invested in keeping Deely in compliance with ever-tighter emissions standards on less carbon-intensive generation, including natural gas and solar power. Meanwhile, CPS Energy’s newest coal plant, Spruce 2, is among the cleanest in the nation for combined nitrogen oxide and sulfur dioxide emissions out of the 1,124 that reported emissions in 2011, according to EPA data. Thanks to the installation of advanced environmental controls, Spruce 2 ranks among the lowest emitters of all US coal plants. 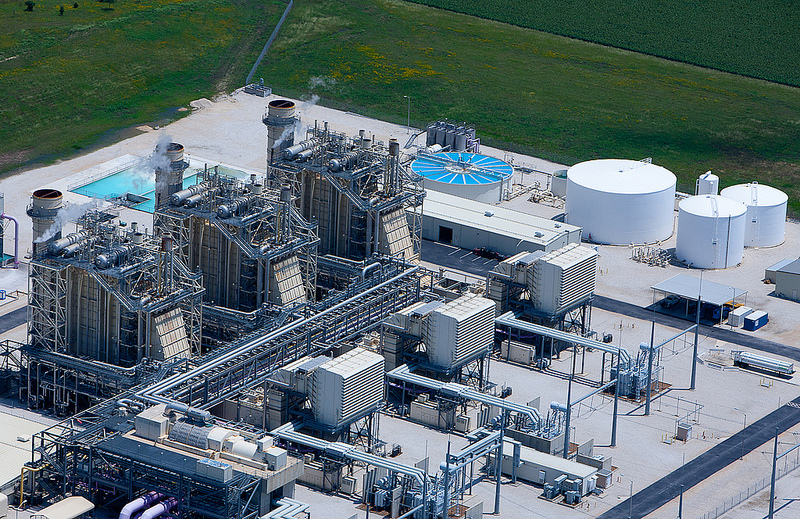 Last year, CPS Energy purchased the 800 MW Rio Nogales combined cycle natural gas plant outside of Seguin TX, which will largely replace that coal power. Using additional natural gas, as well as switching to ultra-low sulfur coal in its coal plants, has led to a dramatic reduction in emissions from 2011 to 2012. Rio Nogales emits virtually no particulate matter, mercury or sulfur dioxide, while using roughly half the amount of water needed to run the Deely units. Nitrogen oxides, which contribute to the formation of ozone pollution, dropped by 23 percent, from 8,737 tons in 2011 to 6,721 tons in 2012. Sulfur dioxide’s decrease was even more dramatic, from 23,268 tons to 10,432 tons. CPS Energy’s carbon dioxide emissions, which Obama said the EPA would begin regulating by 2015, have also decreased from 2011 to 2012, from 18.7 million tons to just under 17 million tons. 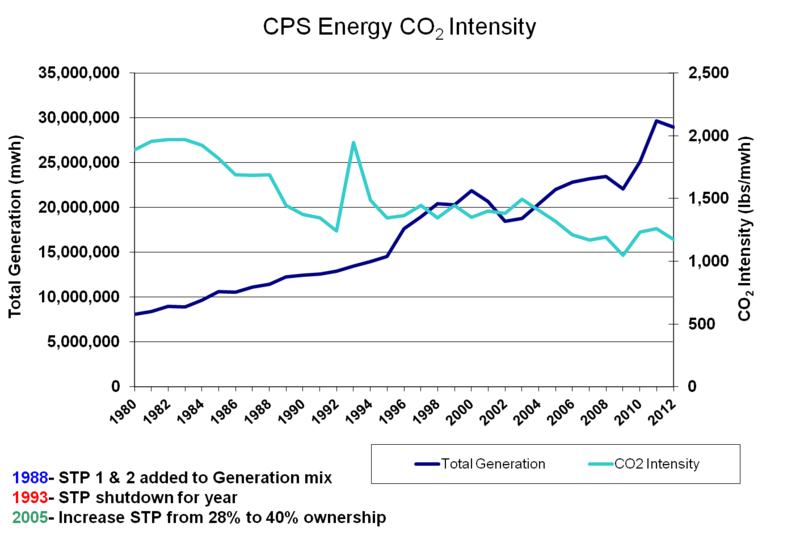 All told, CPS Energy has reduced the carbon intensity of its fleet, even as it has added generation. 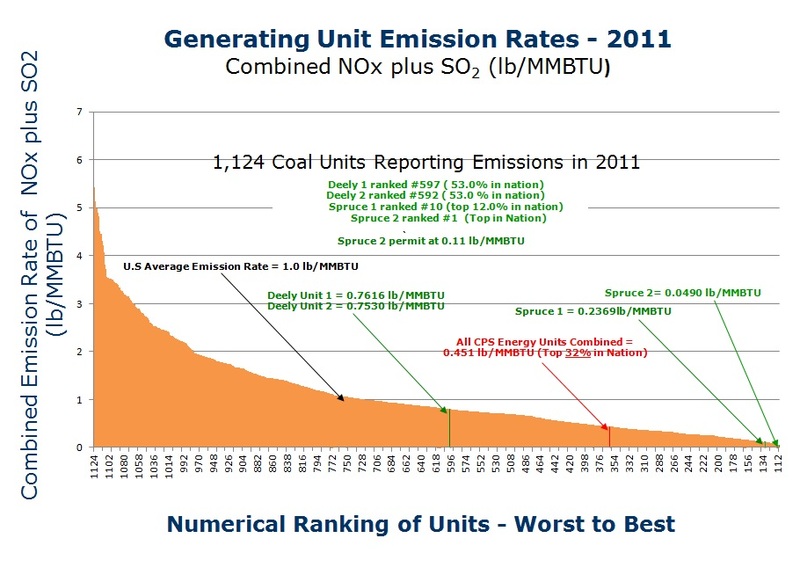 CPS Energy has taken additional steps to reduce the carbon intensity of its fleet, as shown in the chart at the top of this post, including LED street lights,120 public electrical vehicle charging stations, and a landmark deal signed earlier this year that will add 400 MW of solar power to CPS Energy’s portfolio. 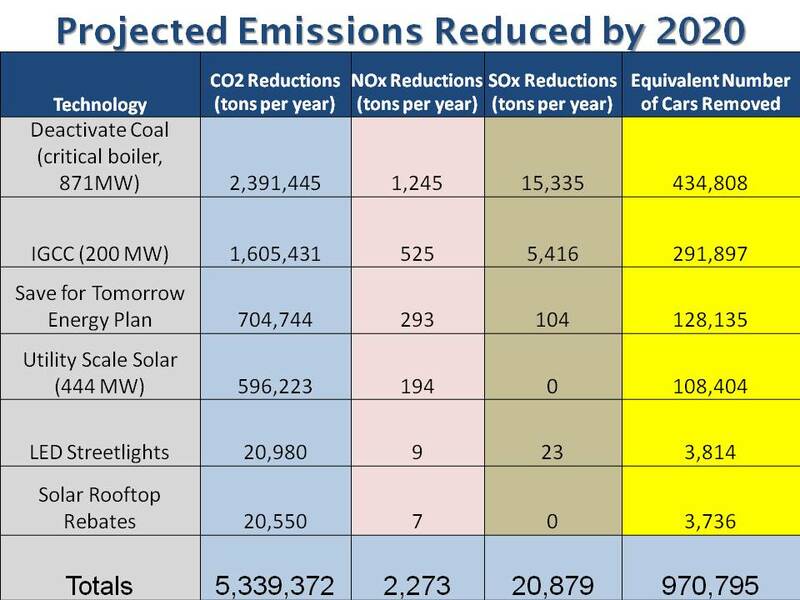 The utility is also on track to save 771 MW through its STEP, or Save for Tomorrow Energy Plan, which includes rebates for rooftop solar power, commercial lighting and HVAC retrofits, free energy efficiency measures for low-income households, and new home construction. CPS Energy has also taken the lead with its Demand Response program, in which customers voluntarily reduce consumption at critical times in exchange for a utility bill credit or rebate.